Hidden Oaks is located in Brownstown Michigan south of Vreeland Road, west off Allen Road. It consists of seven buildings each housing ten 2 bedroom, 2 full bath ranch condominiums for a total of 70 condominiums in this community. We represent a landlord who owns and leases 35 of the 70 units which we have identified both on the site plan and under the floor plans below. If we have any units currently available for lease they will appear at the bottom of this page (as well as any privately owned condos for sale or lease listed on our MLS). CLICK TO GO TO BOTTOM OF PAGE. For those of you who want to get on our waiting list please submit a request, we normally receive a 30 day notice for upcoming vacancies. CLICK TO SIGN UP FOR WAITING LIST TO LEASE A CONDO. 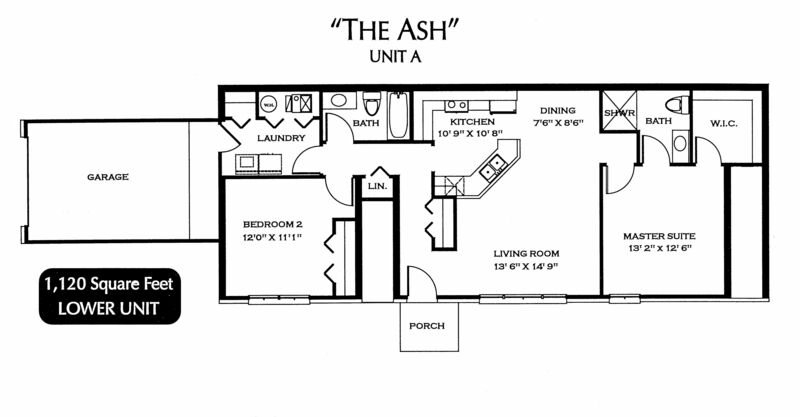 Both the Ash and Birch floor plans shown below are main floor units. 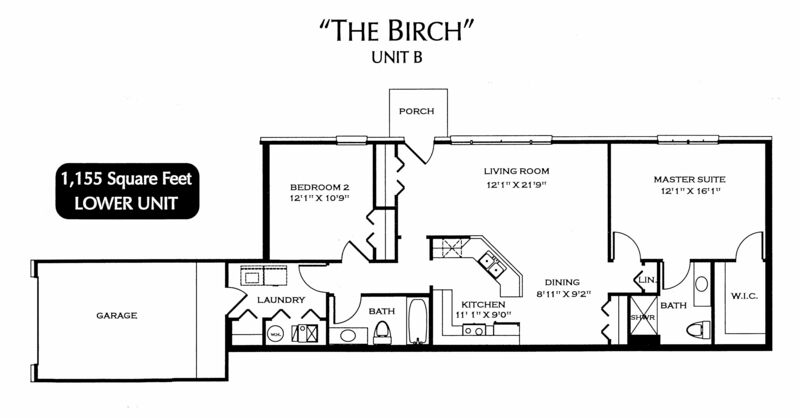 The Birch floor plans are located in the back of each building, where as the Ash floor plans are located in front. 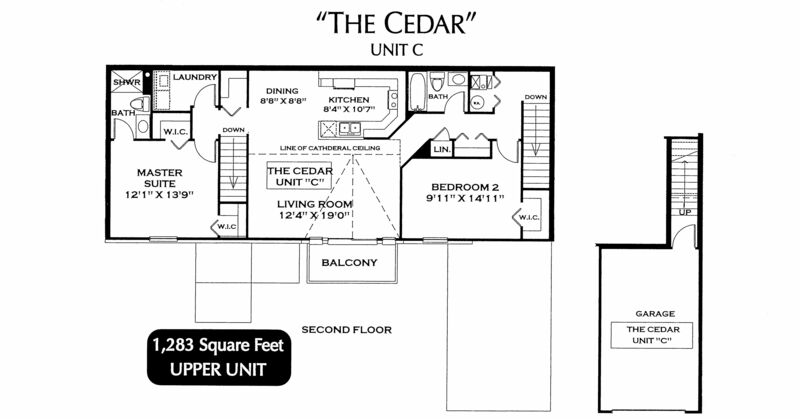 The Cedar, Driftwood and Elm floor plans are located on the second floor. The Cedar plans are located in front, the Driftwood in back and the Elm over the garages. The following units are the ASH floor plan shown above: Unit 3, Building 1 (Reverse Plan), 27632 Hidden Oaks; Unit 11, Building 2, 27611 Hidden Oaks; Unit 31, Building 4, 27253 Hidden Oaks; Unit 51, Building 6, 20004 Hidden Oaks. The following units are the BIRCH floor plan shown above: Unit 2, Building 1, 27621 Hidden Oaks; Unit 12, Building 2, 27614 Hidden Oaks; Unit 33, Building 4, 27252 Hidden Oaks; Unit 52, Building 6, 20003 Hidden Oaks. The following units are the CEDAR floor plan shown above: Unit 6, Building 1, 27626 Hidden Oaks; Unit 8, Building 1 (reverse plan), 27636 Hidden Oaks; Unit 16, Building 2, 27615 Hidden Oaks; Unit 18, Building 2 (reverse plan), 27605 Hidden Oaks; Unit 26, Building 3, 27349 Hidden Oaks; Unit 28, Building 3 (reverse plan), 27337 Hidden Oaks; Unit 36, Building 4, 27261 Hidden Oaks; Unit 48, Building 5 (reverse plan), 20011 Hidden Oaks; Unit 56, Building 6, 20006 Hidden Oaks; Unit 58, Building 6 (reverse plan), 20024 Hidden Oaks. 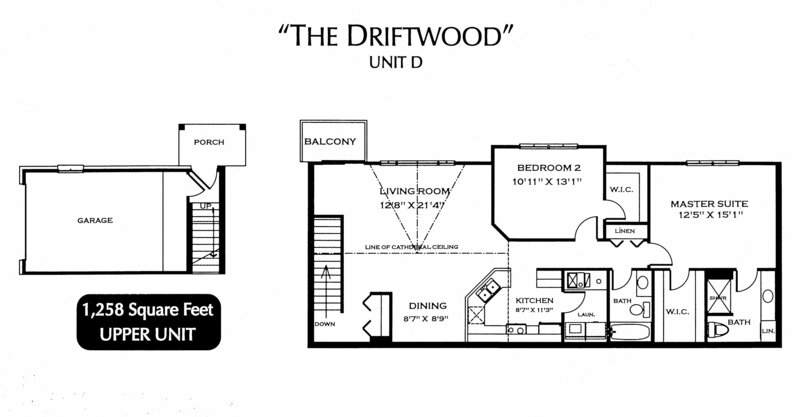 The following units are the DRIFTWOOD floor plan shown above: Unit 7, Building 1, 27625 Hidden Oaks; Unit 9, Building 1 (reverse plan), 27635 Hidden Oaks; Unit 17, Building 2, 27622 Hidden Oaks; Unit 19, Building 2 (reverse plan), 27606 Hidden Oaks; Unit 39, Building 4 (reverse plan), 27248 Hidden Oaks; Unit 57, Building 6, 20005 Hidden Oaks. 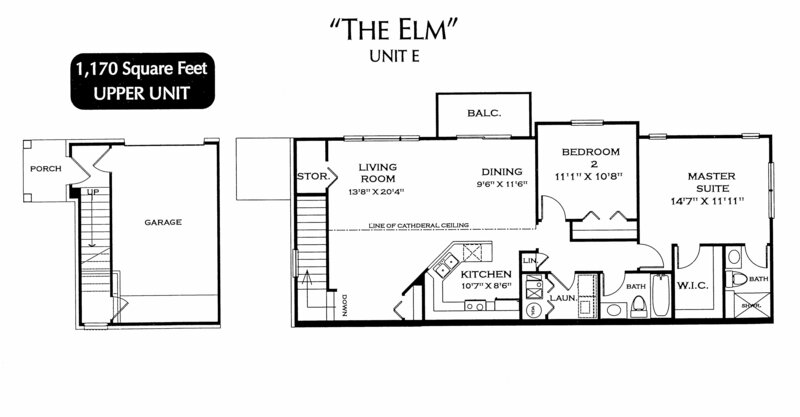 The following units are the ELM floor plan shown above: Unit 5, Building 1, 27620 Hidden Oaks; Unit 10, Building 1 (reverse plan), 27640 Hidden Oaks; Unit 15, Building 2, 27629 Hidden Oaks; Unit 20, Building 2 (reverse plan), 27601 Hidden Oaks; Unit 25, Building 3, 27343 Hidden Oaks; Unit 30, Building 3 (reverse plan), 27341 Hidden Oaks; Unit 40, Building 4 (reverse plan), 27239 Hidden Oaks; Unit 45, Building 5, 20049 Hidden Oaks; Unit 50, Building 5 (reverse plan), 20001 Hidden Oaks; Unit 55, Building 6, 20002 Hidden Oaks; Unit 65, Building 7, 27316 Hidden Oaks. If you don't see any listings below, that means there are no units currently listed for lease or sale on our local real estate MLS for Hidden Oaks. 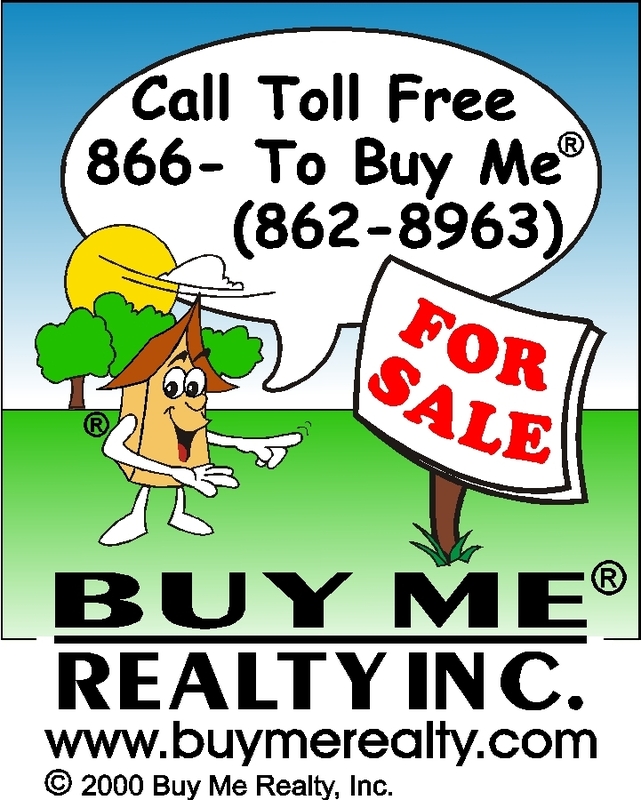 CLICK TO SIGN UP FOR WAITING LIST TO LEASE A CONDO.